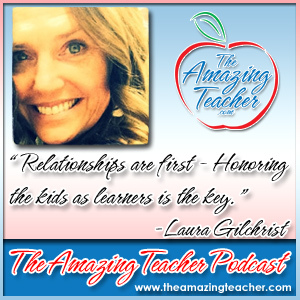 In this episode, I sit down with Laura Gilchrist who is a Bammy Award Finalist and Christa McAuliffe Pioneer in Education Award winner. She also was selected as the Teacher of the Year in her school district. Laura was so great on the podcast. She shared her insights on teaching which focuses on connecting and believing in kids and stepping outside the box. I was particularly impressed with what she shares about Edcamp. As you know, I like the idea of Edcamp, where teachers learn from each other, and Laura shares her insights on Edcamp from the perspective of an Edcamp organizer. What she has done, however, is bring Edcamp into her school with what she calls a one-hour Edcamp. I was really excited about that, because that can be done in any school. So listen for that. Laura also shares her advice on classroom management which focuses on building that positive relationship with students. Her advice is a must listen for any teacher who may be struggling with that tough class. As always, I come away inspired after every conversation that I have with these amazing educators, and my time with Laura was no different. I had a great time speaking with Laura, and I know you will find her insights and advice very inspiring and valuable as I did. Thank you again for spreading the word about the podcast!